The evening will include readings by several noteworthy Bernhard afficianados including author and cultural commentator Dale Peck (The Law of Enclosures; What We Lost); novelist and nonfiction author Lisa Dierbeck (The Autobiography of Jenny X and New York Times Notable Book One Pill Makes You Smaller); award-winning novelist and playwright Joshua Furst (The Sabotage Cafe); poet and performance artist Sophie Malleret, and cultural commentator and editor Choire Sicha (Gawker, Radar, The Awl). Additional guest readers to be announced. Copies of ON EARTH AND IN HELL will be available for purchase and signing at the event. 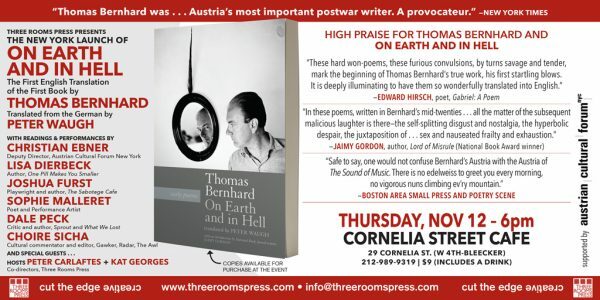 Thomas Bernhard (1931–1989) was an Austrian playwright, novelist, and poet. His body of work was cited in a New York Times book review as “the most significant literary achievement since World War II.” He is widely considered one of the most innovative and original authors of the twentieth century and often associated with fellow mavericks Beckett, Kafka and Dostoevsky. Peter Waugh is a poet, translator and editor, born in Barnet, London in 1956. He is co-editor of subdream the Vienna Journal of English Language Poetry, and publisher of Labyrinth poetry books. He studied with Allen Ginsberg, Ann Waldman, Jackson Mac Low, Ed Sanders, Andrew Schelling, Blixa Bargeld, Andrei Bitov, Henri Chopin and others. His poetry has appeared in anthologies and magazines in England, the U.S.A., Austria, Slovakia, Macedonia and Croatia, as well as in the chapbooks Horizon Firelight (2000) and Haiku Butterfly Death Dream (2002). He is a member of Übersetzergemeinschaft literarischer und wissenschaftlicher Werke (Austrian Society of Literary and Academic Translators) and his highly-respected translations include the bilingual German-English volumes Terminal by Klara Köttner-Benigni and Standpoints by Edith Sommer. He lives in Vienna.